Worthing's district commander says he hopes the recent arrest of 10 people on suspicion of drug supply in the town sends a 'clear message'. Chief Inspector Miles Ockwell spoke to the Herald following news last week that officers made 10 arrests over just two days. On Sunday last week, officers working proactively detained four people for drugs supply and another two were arrested after a report from a member of the public. The following day police arrested four more people on suspicion of drugs supply in the town, police said. 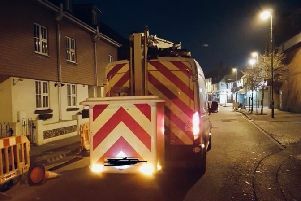 Chief Inspector Miles Ockwell, police commander for Worthing, Adur and Horsham, said: “This activity forms part of our long term strategy to combat county lines coming into Worthing. "In addition to the prevention work we undertake with our partners, we also want to send a clear message to those travelling into Worthing to commit crime that they will be met with a robust Police response. "We utilised plain-clothed and uniformed officers in this operation and we will continue to undertake similar operations to complement our day-to-day policing of the town”.